Pictish nobles ride ahead of the Saxon advance guard. Geowolf the Ravisher chose to deploy all of his raiders on the West bank. Buidhe and Ceol, 2 Pictish 'knights' in advance, then himself with the Raven bearer, 6 Saxon warriors and 4 archers, then Dearg Mor with 4 pictish archer/slingers and 4 Pictish spearmen and finally a rearguard of Wrothgar the Nameless with 6 more Saxon spearmen. (You would almost think he didn't fully trust his Pictish allies which is interesting given the outcome). As the Saxon's narrowed their column to cross the bridge, the Duke gave his battle cry, and calling to Sir Jeffery to follow him, rode ahead. Jeffery's horse apparently stumbled (rolled low on movement) and the Duke had to rein up to maintain formation (they were moving as individuals). Seeing the knights hesitate, the Saxons charged forward, Jeffery, remembering the feighned flight tactics practiced by the Count's Sarmatian mercenaries, fled leaving the Duke to face the enemy alone. Rearing up his stallion the Duke struck down the enemy standard bearer then turned his horse and rode back to the bridge to organize the defence. The invaders surged forward all across the line now. One of their few remaining archers saw Sir Jeffery pull off his helmet and coif to mop his brow and shot an arrow through his cheek causing the brave knight to retire from the field (ok ok he hit then rolled a 6 on his impact die, the attacking archers had no trouble hitting this game but this was one of the very few kills they scored). Buidhe, having cut down the archers spurred after the retreating defenders. Getting over bold he rode up into the rocks after 1 who turned and dragging him from his horse, cut him down. . It is unfortunate that the chroniclers did not learn this man's name as the same brave soldier later took on Dearg Mor and 4 Pictish soldiers, slew one and held the rest at bay for what seemed like an eternity, waiting vainly for help, until finally a Pict crept up behind him and ended his heroic fight. Swearing various oaths which I may not repeat here, the Duke urged his men to scatter and run back to cut off the enemy's path. But, his men were tired and lacked the initiative of the raiders (in a 16 turn game, George moved first 14 times! It wasn't crucial early on and in some cases where I won the initiative die roll I let him go first so that I could shoot first but in the last few turns when he won the crucial rolls, it robbed me of my best chance to counter his final gambit by getting between his men and the board edge. It didn't help that his men rolled as if inspired on those last 2 turns and on average moved nearly twice as fast as mine!.) and though the Duke himself caught a few more of the raiders, the morale of enemy seemed unbreakable now that their goal was in sight. (the last chance I had to save the game was if the Duke's charge managed to panic 4 or 5 of the scattered enemy one after the other but suddenly they got brave and each time the first of the scattered raiders stood and fought meaning the rest didn't have to check, not being past of a group.) Dearg Mor himself and at least 12 other raiders slipped past. There would be missing cattle and worse by dawn. A close game and won by some good decisions on George's part but you will note that George himself and most of the Saxons were cut down while the wily Dearg Mor and his Picts went a- roving behind the wall. We played at a relaxed pace and with breaks and since all the figures were plastic, there was no heavy lifting :) but I will confess to taking the evening and all of the next day to recuperate. Damn! Worth it though and they do suggest resuming normal activity. 3 weeks down, a 1,000 or so left to go. . The most recent game in the Lydian-Mede solo mini-campaign wars was Teaser 12: Rearguard. This followed on from the close fought battle at The Pass in which the Lydian cavalry suffered a major disaster. This is a much smaller action and I almost doubled the unit conversion rate but then I remembered that not only am I supposed to be taking it easy but that the campaign had begun before all units were refurbished or, in the case of new recruits, painted, so I decided to stay with 6 cavalry or 12 infantry per each CS Grant unit. The rules this time were a draft of a new set designed to meet my needs. I had been using WAB and despite not liking some things about them (like characters and neck or nothing morale tests) would probably continued for the sake of compatibility if a summary of the changes had been available, perhaps as a downloadable PDF supplement for a reasonable fee. Since using the old rules would no longer offer compatibility, the new version is very expensive for a slightly revised set of rules and I am against breaking copyright as a matter of principle, I decided to shake their dust from my sandals and write my own. The original draft is on my gathering of hosts blog and the updated one should be posted by Monday at the latest. The battle takes place along the length of a narrow valley with a river down the middle. The terrain along the river is fairly open except where farms intrude but on either side are rocky hills and patches of scrub and woods. Since a Mede invasion was postulated and the Lydians took a bit of a pasting despite the technical draw last game, I made them the rearguard. The scenario calls for 5 defending units: 3 infantry, 1 cavalry and 1 gun. Since there was no battle-ready cavalry and the terrain is not really cavalry friendly anyway, I settled on 24 Heavy Phyrgian spearmen in 1 unit, 2 units of 12 Thracian peltasts and 12 Anatolian levy skirmishers with sling or bow, all under General Aloettes. Their mission is to prevent any Mede units from exiting from the far end of the table. Secret deployment is a bit tricky for solo games so I used the old playing card gambit. One card for each unit plus 1 dummy. I deployed them blind, not knowing which was which until they were revealed. The invading Medes translated 9 units: 6 infantry, 2 cavalry and 1 gun into three 24 man medium infantry units with bow and spear, (the Hyrkanians, and the Ecbatana and Raffum Regiments) a unit of Armenian levy skirmishers with slings and two 6 man squadrons of the Raffum medium cavalry with javelins, all under General Rosius in his chariot. General Rossius, with some idea of where enemy units might be but no sure knowledge deployed the cavalry supported by 1 infantry unit on the left bank and the rest of the troops on the right bank with the skirmishers in the lead. All units had to be in column and follow the river till enemy was spotted. Given that there were no sub commanders and that under these rules, units without a general within 12" might not move, splitting the force may not have been the wisest course. The Medes won the initiative and pushed forward into the valley. Flipping over the foremost card, it turn out to be the Anatolian slingers who advanced and opened up with a devastating volley of stones and arrows. The Medes halted in disorder. The 2nd squadron of the Medes deployed forward and soon found that trading javelins with twice their number of slingers was not a winning tactic. On the 3rd move, the rallied Mede cavalry bypassed the slingers and pushed forward, leaving them to the Ecbatana regiment. High time for the Anatolians to pull out but being on their own they just stuck it out.The Ecbatana Regiment, perhaps smarting a bit from their defeat in the last battle, fired one volley then pushed in with spears. It looked like a walk over but due to the difficult terrain and some good rolling, several turns passed before they finally cleared the way and started the weary business of trying to extricate themselves. The only possible conclusion is that undrilled medium infantry should neither go hunting in the woods nor try to execute fancy maneuvers when in a hurry, especially not if chronically unlucky with dice. I think it took about 4 turns to back up, wheel around and start heading back up the valley. Time was a wasting! Across the river, the Armenians tripped a unit of peltasts who charged in expecting them to run, These Armenians have a 35 year record of hard service though and decided to put up a fight. They were rewarded by luck and it was three turns before the battered Thracians finally pushed them back. By then the Raffum regiment was at hand and the Thracians began the weary business of retreating up the valley as slowly as possible, seeking to hold the enemy back without risking a tangle with the medium infantry whose bows took a heavy enough toll. Luckily for them, the Medes were usually beyond command control and showed re-markedly little initiative. (With a 50% chance of stalling when general-less, I think they managed about a 75% fail rate over the course of the game, since the Lydians had about a 75% success rate it sort of evened out in a purely statistical manner) . The Thracians even managed recover their strength somewhat when Aloettes rode forward to rally them during one of the lulls. Having bypassed the slingers, the Mede cavalry pushed ahead brashly only to be surprised by Thracian peltasts emerging from behind a rocky hill. A heavy volley of javelins tore into them and the remnants of the white squadron broke and fled. Ignoring the destruction of the white squadron, the yellow squadron pushed ahead, urged on by Rossius in his chariot. Flipping over the last hidden unit cards, Aloettes realized with a sick feeling that the spearmen were on the far bank and no Lydian units stood between the Mede cavalry and the board edge. If the Medes won the initiative it was as good as over, they would be out of reach. The dice rolled out.....initiative to the Lydians! Command roll for the Thracians.... passed! They turned and raced down the slope, not able to charge but close enough to hurl some javelins, nothing like boxcars at a critical moment! There was still a chance that Rossius could rally the Raffum squadron despite it being 1/2 strength with enemy to the rear but it was a slim chance and he was barely able to hold them in place. The Phyrgian spearmen were now pouring over the bridge and soon the remnant of the squadron was cut off and destroyed, Rossius escaping by the skin of his teeth. It is not a wise general who depends on luck but two games in a row Aloettes has had to make a risky move to try and rescue the game and been smiled on by the gods. After a slight pause to reorganize, the battle now entered its last phase. Leaving the Ecbatana regiment to make its slow way forward across hedges and pausing often (ie failing out of command rolls), Rossius crossed over the main bridge and led the right bank column forward. Aloettes and the spearmen also crossed over and took up a defensive position. An attempt to bypass the Lydian line was foiled by the nimble peltasts though these were eventually chased off and at last the main lines clashed, both sides led by their generals. The unlucky Rossius fell at the first clash but his Medes struggled manfully with the heavily armoured Phrygians and eventually the bold Aloettes was struck down by an arrow. Still both sides stuck to their work until finally the remaining Thracians, sure that the Ecbatana Regiment would never exit the valley in the short time available before dark, crossed over the bridge and fell on the flank of the Raffum Regiment. These finally collapsed and were hunted down in the hills. There was little for the Ecbatana and Hyrcanaians to do but fall back up the valley screened by the handful of remaining Armenians, and await the arrival of the main body. Whether or not Aloettes recovers from his wounds, the pass was held till dark. Last Sunday 2 friends came by to distract me and we took advantage of a warm day to game under the Willow tree. The first game as mentioned in the last post was a small Russian Civil War action. Les had also brought along his 10mm tricorne fellows, just in case. 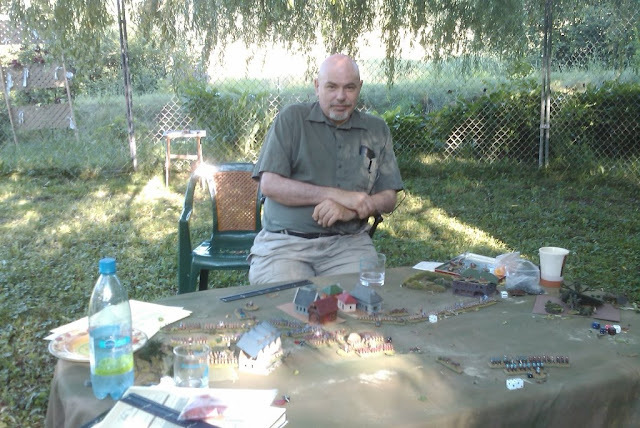 Since Jerry had to leave after several leisurely hours of coffee, conversation and cossacks and day light and energy remained to us, we reset the table, reseated our selves (I'm becoming very fond of sitting through a game! ) and broke out Back Powder. The afternoon was somewhat more advanced however and a faint breeze had sprung up, sending the foam stonewall and hedge that marked the objective, tumbling across the table to be replaced by an unceremonious hunk of gravel, a constant barrage of Willow leaves occasionally obscured the lines of fire and Mystery the misplaced kennel now woodshed cat who can go days without being seen, interrupted us long enough to insist upon being fed early. Most memorable was the invasion of a ferocious alien beast bigger than a man (well bigger than a 10mm man) with a smaller green worm impaled on its fangs. This creature, which can be seen crawling over the bayonets of one of the .....well, the not-Austrian regiments under Les's command (there are names for these countries but I have not yet learned them by heart.) right behind the colours, spent a considerable while dodging bullets and dice as it sought a quite place for dinner. Stout hearted lads, they didn't flinch at all. Here are the amended rules following a proper play test on Sunday. 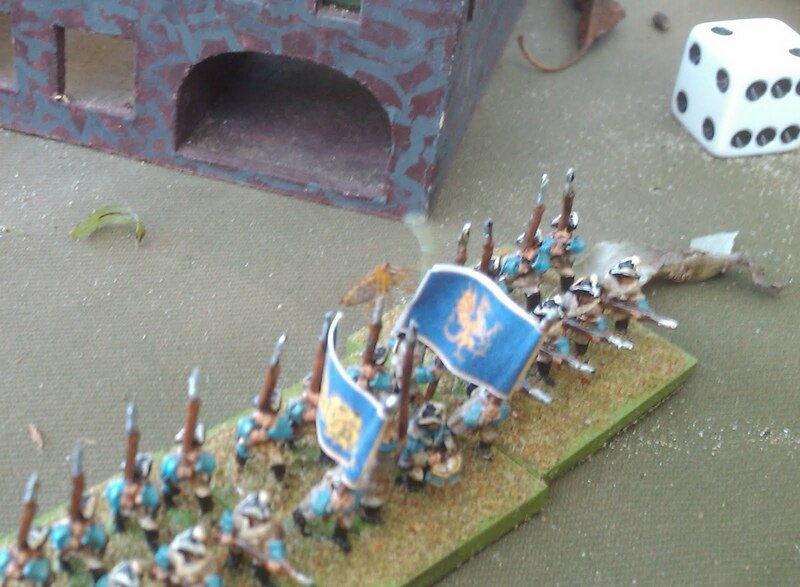 The hex sheet was replaced by one of my mottled cloths and the troops were all flocked but not yet snowed on. The small isolated village was replaced by a wood and the village composed of 3 huts. All else was as for the first game. An airplane had been authorized for White (since he had one) but in the heat of the action the GM/Red cavalry commander forgot it and the White commander didn't pull it out to show until after the game. Such is war(gaming). No pictures were taken unfortunately. I'll post the rules again but I also have the actual .doc file if any one wants it to muck about with. The Red infantry under Les were all deployed in and about the main town with no outposts. The Whites under Jerry bombarded the town and attacked up through the wood on their right with 1/2 the infantry while holding back the cavalry, armoured car and remaining infantry. A Red MG dug in to the left front of the village, with amazing accuracy, mowed down everything in range, cover or not, including a rather forward Forward Observer. A brief pause ensued while the guns relocated and opened direct fire on the pesky thing while the cavalry began their flanking manoever on the White left. Once the brave MG was finally silenced, the White infantry rushed forward. In the nick of time the Red Cavalry appeared and a massive cavalry melee broke out ending in the complete destruction of the Cossacks. The Red artillery galloped to the right, deployed and caught the White infantry in the open threatening to break up the assault.enough Whites survived to move up and assault the town however and the Red conscripts proved no match in hand to hand combat. Luckily the battalion commander was made of sterner (luckier) stuff and held the left hand redoubt single handed while until the last Red platoons rushed forward to support him. It was a close run thing but although the armoured car finally came forward, their infantry was pinned in the open and their Battalion HQ shot down. With the Red cavalry bearing down on the flank of the gun line, it was all up. 1. The switch to saving throw vs accumulated hits meant that even 1 lucky hit matched with an unlucky hit could be deadly while even seemingly overpowering fire could be survived if the dice so dictated. This felt closer to Morschauser and added tension to the game which I liked. 2. Attacking over the open against MG's and artillery is deadly and usually futile. 3. Entrenched infantry can be softened with a bombardment but eventually you need to send your own infantry in. 4. Don't rely on conscripts. They panic easily under fire and are hard to rally. 5. Like most dice dependent games, a run of bad/good luck can twist things but it usually evens out. In this case, early on the Whites couldn't make a saving throw to save their lives (literally) and later had trouble rallying (even their elite troops who only needed 2+ with HQ attached) . In the middle however the Reds suddenly couldn't hit and or make the saving throws for their conscripts. In the end I am fairly sure that the piece meal attacks were more decisive than the die rolling. Armoured, each car fights as artillery or A/C depending on armament. 3. Sequence of Play: Players take turns. During a player's turn he may activate his units 1 at a time. When all of a player's units have been activated, his turn is over. c. Limber/unlimber, Pack/Deploy, set up telephone. 5. Command. All units must be assigned to the command of an HQ. There is also an overall Force HQ. If, at the start of it’s side’s turn, a unit is not within 6” of its HQ or of the overall Force HQ, then it must roll 4,5 or 6 on a die if ordered to move or close assault. +1 if elite, -1 if conscripts. A unit only checks once per turn, if it fails then it may shoot instead. 6. Movement. A unit may move in any direction and end up facing as desired as long as no part of the base exceeds its movement allowance. Some troops types need to limber/pack etc before being moved. A unit may not come closer than 1” to an enemy during movement. 7. Hits. If shooting or melee die hits on a 4,5,6 if a target is in the open, on a 5 or 6 if the target is obscured or on a 6 if the target is entrenched or armoured. For each hit roll 1 die to save: on a 4,5,6 the unit is only pinned otherwise it is destroyed. +1 if elite or an HQ, -1 if conscripts. Armoured targets are rolled for as normal if hit by artillery or tanks carrying artillery. If hit by other fire then an armoured unit which fails its save is only pinned and one which makes its save is unaffected. Units which are destroyed are assumed to be suffering from a combination of heavy casualties and panic. 8. Pinned. A pinned unit may not move, shoot or close assault until it is rallied. A unit rallies on a roll of 4,5 or 6. +1 to the die if an HQ is touching the unit, +1 if elite, -1 if conscript. 9. Entrenched. Only infantry, MG’s, mortars and HQ may be entrenched. Infantry and MG's defending a village count as entrenched. 10. Concealed. A unit in woods or a village may only be seen and shot at if it moves or fires or the enemy is within 1” of it. Once spotted it remains on the table. 11. Line of Fire: In order to fire a unit must be able to trace an unobstructed line of fire from the center of its front to the target, within an arc of 45 degrees either side of straight ahead. Units, of either side, hills, woods and villages all block the line of fire. The only exception to this is that mortars and artillery firing a bombardment may fire over head. Mortars and artillery firing a bombardment may trace a line of fire from an observer instead. Only a FAO with a radio or a telephone connection may direct artillery, only a unit’s HQ within 6” may direct a mortar. Range is still traced from the firing unit. 12. Bombardment: Artillery may fire an indirect bombardment instead of firing direct. Nominate a target spot and then roll 1d6 to hit and another for deviation in inches (ie a roll of 4=4”). You may use a scatter die in which case bullseyes indicate a direct hit and an arrow indicates the direction of deviation or you may roll needing 5,6 to hit dead on and a spinner or other means to determine the distance of deviation. Place a 4” circle over the hit point and roll 1 die against each unit of either side that is at least ½ inside the circle. One FAO may direct the fire of as many artillery units as are available but he may only engage 1 target per turn. 13. Close Assault. Only infantry, cavalry and tanks may initiate close assault. To close assault, the target must be within 1”of the target and the target must be directly to its front. The assaulting unit must not be pinned. Move the attacker into contact with the closest face of the enemy unit. A unit may not move past 1 enemy unit to attack a different one. A unit may only assault 1 enemy unit but a unit may be assaulted by 1 enemy in front, 1 on each flank and 1 in rear. Both sides roll simultaneously. A unit will roll dice as per the chart and inflict 1 hit for each score of 4,5,6 Modify dice: -1 if pinned, -1 if attacked in flank or rear. Make saves as normal but armoured targets may be destroyed by infantry. After removing any destroyed units, if the attacker is pinned, and any enemy remains within 1”, then the assault is over, move the attacker back 1”. If the attacker is not pinned and the defender is still alive then roll again. If the attacker is not pinned but the defender is destroyed then the attacker may get a free action to occupy the defenders position or assault another enemy with 1”. 14. Terrain: Infantry, MG’s and Mortars are not slowed by terrain. Cavalry move ½ if they enter woods, swamp or rough ground. Tanks may not enter woods or swamp or move off road through a village but may move ½ across rough ground and cross obstacles. Artillery, armoured cars, trains and wagons may not enter woods or swamps or cross obstacles, and are assumed to be on a road if in a village. Artillery may not deploy in a village. Armoured trains may only run on rails and are not affected by terrain that the rails pass through. Other terrain effects may be established before a game. 15. Air Support. If a plane shows up to provide ground support, the controlling player may select a target any where on the board, then roll for deviation and hits as if it were a bombardment. The plane will remain over the target and may be fired at during the enemy’s turn, needing 6’s to hit. If it fails a save it will leave the table for the rest of the game, a pin result will cause it to immediately fly off to a safe place until it rallies. 16. Additional, Optional and Special scenario Rules. Feel free to add any additional complexities that take your fancy. 6. Hits. If shooting or melee die hits on a 4,5,6 if a target is in the open, on a 5 or 6 if the target is obscured or on a 6 if the target is entrenched or armoured. For each hit roll 1 die to save: on a 4,5,6 the unit is only pinned otherwise it is destroyed. +1 if elite, -1 if conscripts. Armoured targets are rolled for as normal if hit by artillery or tanks carrying artillery. If hit by other fire then an armoured unit which fails its save is only pinned and one which makes its save is unaffected. 7. Pinned. A pinned unit may not move, shoot or close assault until it is rallied. A unit rallies on a roll of 4,5 or 6, . +1 to the die if an HQ is adjacent , +1 if elite, -1 if conscript. 8. Entrenched. Only infantry, MG’s and mortars may be entrenched. Infantry and MG's defending a village count as entrenched. 9. Concealed. A unit in woods or a village may only be seen and shot at if it moves or fires or the enemy is adjacent to it. Once spotted it remains on the table. 10. Line of Fire; In order to fire a unit must be able to trace an unobstructed line of fire from its front to the target. Units, hills, woods and villages all block the line of fire. Mortars and artillery may trace a line of fire from an observer instead. Only a FAO may direct artillery, only an HQ may direct a mortar. Range is still traced from the firing unit. 11. Close Assault. Only infantry, cavalry and tanks may initiate close assault. To close assault, the target must be within 3”of the target and the target must be to its front. The assaulting unit must not be pinned. Move the attacker into contact with the closest face of the enemy unit. Both sides roll simultaneously. A unit will roll dice as per the chart, hit on 4,5,6 -1 if pinned, -1 if attacked in flank or rear. Make saves as normal but armoured targets may be destroyed by infantry. If the defender is destroyed then the attacker will occupy his position, even if pinned. If the defender survives but the attacker is pinned, the assault is over, move the attacker back 3”. If the attacker is not pinned and the defender has not been destroyed then both sides must roll again. 12. Terrain: Infantry, MG’s and Mortars are not slowed by terrain. Cavalry move ½ if they enter a hex of woods, swamp or rough ground. Artillery, armoured cars, trains and wagons may not enter woods or swamps, and are assumed to be on a road if in a village. Artillery may not deploy in a village. Armoured trains may only run on rails and are not affected by terrain that the rails pass through. Other terrain effects may be established before a game. "Oh for a Muse of fire"
Draft RCW rules for hexes.